Lowhostingrates is a Zamfoo License Provider. SuperAlpha & Alpha Plugin Script. Alpha Master licenses allow you to sell Alpha accounts on your VPS or Dedicated Servers. Create Super Alpha accounts on your server with this popular Zamfoo plugin. The ZamFoo software suite is a series of WHM plugin modules (also known as WHM add-on modules) catered towards easing the burden of web hosting providers that sell shared hosting accounts using the Cpanel and WHM hosting platform. Hundreds of companies use this software to create SuperAlpha , Alpha , Master and reseller hosting accounts. subscription payment method at checkout. One time payments will not be excepted. 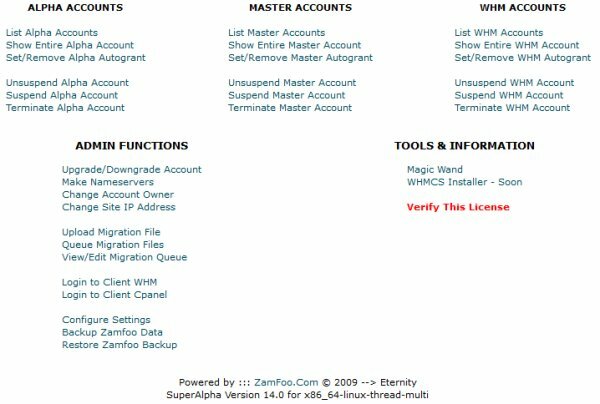 ZamFoo Super Alpha Reseller is a better version of the popular WhmReseller plugin or WHM add-on software that allows Root Reseller, Master Reseller, Alpha Master Reseller and Super Alpha Reseller accounts to automatically create and manage WHM reseller hosting accounts. Super Alpha scripts allow reseller and sub reseller services up to 4 levels from within your root WHM. ZamFoo Alpha Reseller is a better version of the popular WhmReseller plugin or WHM add-on software that allows Root Reseller, Master Reseller and Alpha Master Reseller accounts to automatically create and manage WHM reseller hosting accounts. It integrates with your WHM Control panel and allows root users to offer reseller and sub reseller services up to 3 levels.